What a cutie! 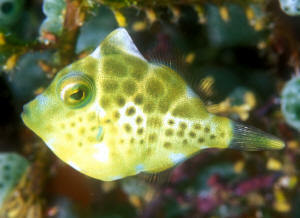 A juvenile filefish in N. Sulawesi. Good afternoon Bob. Hope the knee is getting better. I was wondering if you could offer any “rule of thumb” on how much vinegar I need to add per gallon of Kalk to extend its shelf life? Thanks! "I add 60ml of vinegar to a gal of Kalk. I keep my Kalk concentration at 2tsp per gal. Use it as a carbon source and to help keep the Kalk in solution better. 60gal cube with 10gal sump. I add 600ml/day of Kalk which is roughly 9.1ml of vinegar dosed a day"
I currently run a 125 DT with a 50 gallon sump. I have a mix of softies, LPS, and SPS however, I have recently taken a liking to more SPS (since my Majestic doesn't pic at them) and have been adding more and more of them. I currently sit at (SPS) 4 plating Montipora (3 red 1 purple), 1 Birdsnest, and 1 blue Acro. (LPS) Chalice, 4 large colonies of starpolyps, and 2 large heads of Hammer. (Softies) 3 giant hairy mushrooms which are fun to feed, 1 toadstool over 5 inches, a couple of Kenya trees (don't really care for them), and a couple groups of pumping xenia and a RBTA. I also have a large purple gorgonian. I think that's about it off the top of my head. Anyways on to the question. I recently started having low Alk (7) and ca (360) even with regular water changes. PH was holding steady at 8.3 though. So I thought I would give Kalk a try. I mixed about 1-1.5 tsp per gallon into my ato. 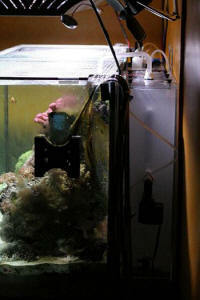 My ato is gravity driven as the line runs into another room and is attached to a float valve in the sump. The bulb floats down and adds water till its full. Pretty fail safe. The problem, the water in the ato is cloudy and has formed a thin but yet semi hard film at the top of the water. When the water drips into the sump the ato water seems to solidify into a white snow flake and then float to the top of the water in the sump. Nearly the entire surface is covered in this area of the sump with this semi solid white substance. Testing daily as I am worried. Ph holding steady at 8.4, Alk holding at 10, and ca holding at 420. This film forming at the top of the water in my sump and ato doesn't seem right. Need somebody to point me in the right direction. What is this film? I lose about 1.5 gallons a day in evaporation. Long but I thought necessary.FYI I raised all my levels before I switched to Kalk. Thank you so much for your help! You are the best! Oh and I am aiming for the least maintenance intensive method. That is why I went with the ATO. Fill it up and walk away for a week. Kalkwasser reactor problem 7/13/06 Hi! <Hello there> I got a custom made <Non-commercial...> Kalkwasser reactor one month ago. So far I am very pleased with the impact on the water chemistry. I have not noticed any magnesium depletion at all so far and I am ready to react to that anyway by adding magnesium in the new saltwater reserve... <Good> The reactor keeps my calcium to around 400ppm and the alkalinity between 7 and 7.5. My Ph goes up to 8,43 by day and down to 8,25 by night. <Fine> I even use my Neptune Jr. and the fans connected to it to prevent Ph from going below 8,25. When it goes below that value the fans start and cause significantly more evaporation, therefore more Kalk enters the tank and pushes the Ph up. <Okay> If you can give me some advice here regarding the autonomy of the reactor. The first time I filled it and added calcium hydroxide, I used 10 big tablespoons of Kalk. The reactor worked for 4 days. On the 5th day, I had to add more powder because the Ph was going down and the calcium as well. I then started to experiment by adding different amounts of powder. I tried different things between 2 and 30 tablespoon. Always the same result: must add more powder after just 4 or 5 days. <... this may be "it" for this given tool, the size, make-up of your system...> I thought I would have at least 2 weeks of autonomy with such a reactor. <Depends...> That's what people report with reactors that are smaller than mine in comparison to the size of the system (if I remember well the reactor is around 30 L and my system is 300L-325L net). The mixing pump runs 2 minutes each hour and the osmolator stops for 15 minutes each time to leave time for powder to sediment and prevent it from entering the system undissolved. What surprises me most is that there is no relation between the amount of calcium hydroxide powder I add and the length of time the reactor stays efficient. Can you give me some advice? Am I doing something wrong? <Doesn't sound/read "wrong"... just doing what it is "made" (engineered, constructed) to do... You might want to experiment with another source/grade of Kalk...> If I can't work it out, I think I will try and buy a Deltec or an Aquamedic stirrer. 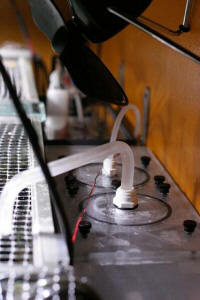 They both use a stirring rod instead of the common magnetic stirrer or maxi-jet pump. I don't know if it would improve anything to change the reactor. <These units will require less "fooling"... be more autonomous...> The Deltec is twice the price of the Aquamedic and seems quite similar. Do you have any idea if it's worth paying the double for the Deltec? <Is a better unit IMO...> Here are two pictures of my present reactor: Thanks!